The Kaulunani Urban and Community Forestry Program focuses on improving the health and viability of trees in Hawai‘i communities through educational programs; financial support in the form of cost-share grants; technical training; Arbor Day promotions and public/private partnerships. Funding comes from the State and Private Forestry Branch of the USDA Forest Service. As of 2019, over $3.6 million dollars has been awarded to almost 400 organizations through these cost-share grants, which have been matched by over $8 million dollars in cash and in-kind contributions. Balance the urban and natural environment by encouraging, empowering and equipping the people of Hawai‘i to mālama the trees in our ‘āina. The purpose of the Kaulunani program is to build the capacity of communities to plan for, establish, manage and protect trees, forests, green spaces and related natural resources in or near urban areas. This program provides social and economic benefits to the public, and links governmental, private and grassroots organizations to improve the ecosystem and quality of life in or near urban areas. The Kaulunani Program is guided by the State’s Forest Action Plan. The Kaulunani Council worked as part of the Hawai‘i Forestry team to analyze forest-related conditions, trends, threats, and opportunities within the State, to assure that federal, state, private and community resources focus on important issues. 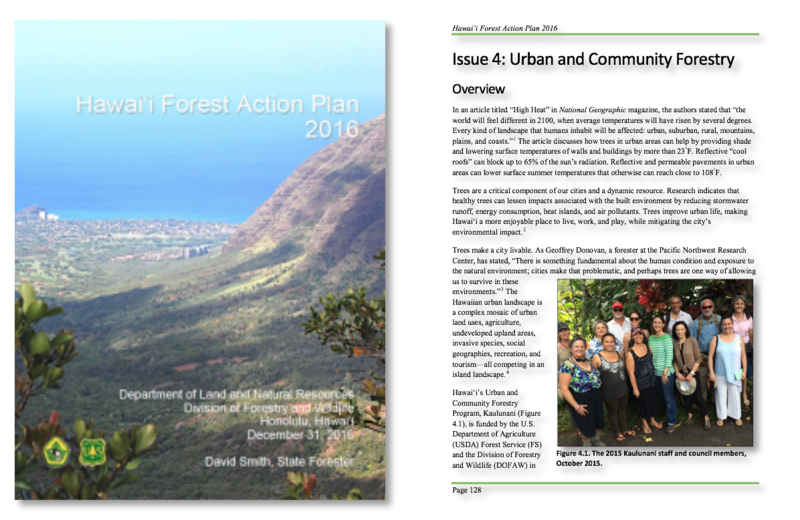 Issue Four: Urban and Community Forestry section from 2016 can be found here. Improve the understanding of the benefits of trees in urban areas and communities. Reduce carbon emissions, conserve energy, improve air quality and increase other environmental benefits. Support community tree planting and tree demonstration projects. Enhance the technical skills and knowledge of the urban forest industry. Expand research and educational efforts. Kaulunani has grown from a program primarily focused on tree planting projects and education, to one that engages in challenging topics such as invasive species control, the role of trees in shoreline protection and restoration practices, measuring the environmental benefits of street trees, and other unique projects such as supporting chemical trials for control of the Erythrina Gall Wasp. The key to the success of this program is the blend of partners, people, and projects. Project elements such as environmental change, advanced planning, leadership, volunteer commitment, community involvement, interagency partnerships, appropriate plant selection, proper horticultural procedures and maintenance became leading indicators of successful urban forestry projects. 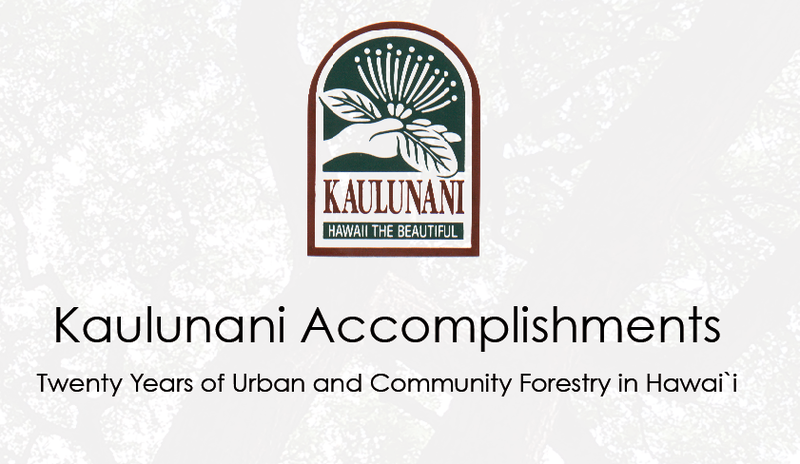 Kaulunani helps communities improve the quality of life within the built environment through actively participating in urban forestry projects and gaining a better understanding of the role trees play in cities and neighborhoods. Kaulunani funds proposals to support urban and community forestry projects and Arbor Day tree giveaway programs across the State. As of 2019, over$3.6 million has been awarded toalmost 400organizations through these cost-share grants, whichhave been matched by over $8million in cash and in-kind contributions. Most grant awards range between $500-$14,999 (‘Ilima level and Mamaki level). Large scale projects with budgets of $15,000 and more, Level II (‘Ulu level), may be considered with program staff consultation, require a pre-proposal, and are contingent on the availability of federal funds. 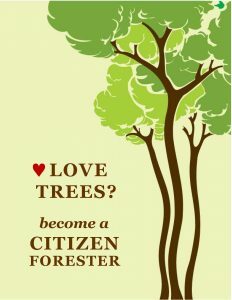 The Citizen Forester Program is a Level II funded collaborative project of federal, state, and city partners. The Citizen Forester Program trains, certifies and supports community members as citizen scientists to collect urban tree inventory data. Citizen Foresters work as ambassadors for Hawaiiʻs urban forests while collecting usable data on trees in the cityʻs “Right-of-Way”. Since its inception in 2016, over80 volunteers have been trained as CitizenForesters and over 6,000 trees have been mappedin Kailua and Honolulu with exciting expansions in the works. Where are there concentrations of care? 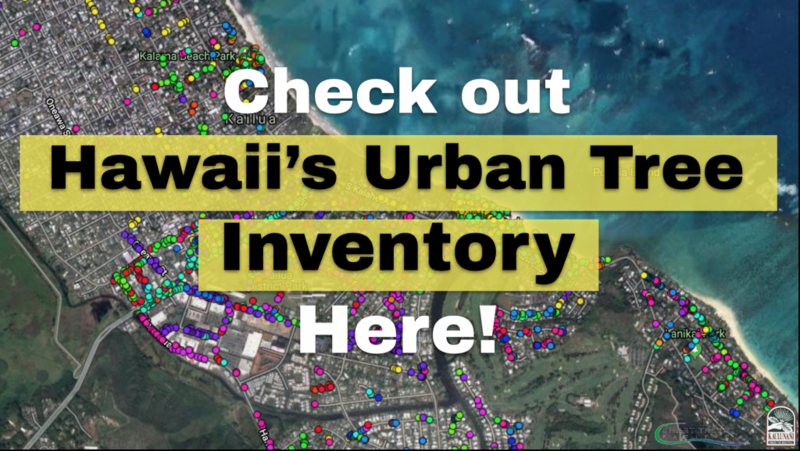 STEW-MAP collects survey data to create a public, online stewardship database and map of community, civic, and other organizations that mālama ʻāina & kai — including those that conserve, restore, manage, monitor, transform, advocate for, engage with, and/or educate about the local environment. The Tree City USA program recognize cities for their excellence in urban forestry management. 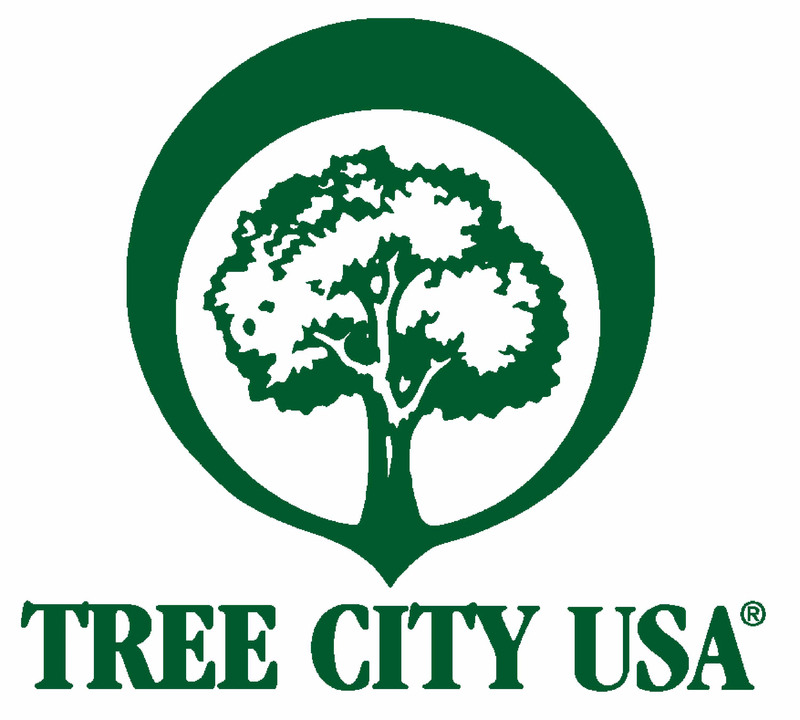 Tree City USA is a program from the national Arbor Day Foundation. The program has been greeningcities and towns across the United Statessince 1976. It is a nationwide movement that provides the framework necessary for communities to manage and expand their public trees. Tree City USA cities require: (1) a Tree Board or Department,(2) a Community Tree Ordinance, (3) a Community Forestry Program with a minimum of at least $2USD per capita, and (4) an Arbor Day Observance and Proclamation. The state of Hawaiʻi has been proudly participating in the program since 1976 with our first commnity, Maui. We continue to grow and our happy to welcome new communities each year. This work is being funded entirely or in part by the Kaulunani Urban and Community Forestry Program of the DLNR Division of Forestry and Wildlife; and State and Private Forestry, branch of the U.S.D.A. Forest Service, Region 5.